LAW school students will follow acting tips so that they don’t fluff their lines when they stand up in court. Communication skills’ trainer and experienced actor, Bridget McCann begins working today (Monday, January 30) with budding lawyers at Strathclyde Law School who have chosen an advanced criminal advocacy elective as part of their Diploma in Professional Legal Practice Course. “Communicating with style, confidence and authority in court forms the basis of all competent advocacy,” said Bridget, an established theatre and screen actor who will be involved with the students for ten sessions. “There is an element of performance required for lawyers in court, too, and these sessions will introduce tried and tested stage skills to help them sound, look and more importantly, feel more confident. “In the courtroom, lawyers must be aware of their status and the positive impact they can make. “Effective speech delivery, movement and self-assurance can be persuasive factors for a courtroom lawyer. The Strathclyde students will go on to appear in mock trials at Glasgow Sheriff Court – before a real Sheriff – and deal with expert witnesses who will be played by Forensic Science Students from the University who are also using this experience as part of their MSc degree course. Other professional tutors from the Law School will teach the students on issues such as examination-in-chief, cross-examination and trial preparation while Bridget will teach them court craft and delivery. 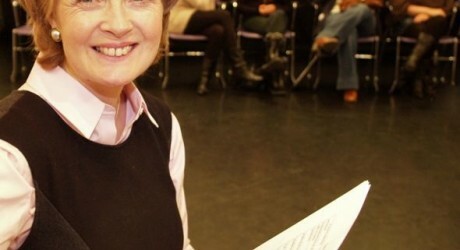 Bridget’s workshops aim to help the students so they can learn to enter a court confidently, cope with nerves and use their voices in a more professional manner with better clarity of speech and vocal skills to keep the interest of their listeners. “Of course, these skills are not just useful in court but also in life for the likes of job interviews,” said Bridget, who holds monthly coaching sessions for lawyers or court practitioners at the Legal Services Agency. A trainer for many years, specialising in presentation skills with both corporate and personal clients, law firms, advocates, sheriffs and universities, Bridget recognises that public speaking, giving presentations or responding at interviews doesn’t come easily for everyone. “These can be real knee-knocking, sweaty palm events preceded by sleepless-nights,” said Bridget, whose roles have included ‘Taggart’, ‘High Road’, ‘Rab C Nesbit‘, ‘Plays for Today’, ‘River City’ and ‘Still Game’. Karen Barton, academic director of the Legal Practice Courses and deputy head of the Law School, said: “In the Diploma in Professional Legal Practice at Strathclyde we are offering new electives which will help prepare our future lawyers for all aspects of legal practice. “Working alongside Bridget, our team of experienced court practitioner-tutors, the Forensic Science Course at Strathclyde and Glasgow Sheriff Court, we have been able to produce a course which is focused on skills’ development and provides the best practice for aspiring court lawyers. MEDIA RELEASE posted by Mike Ritche Media. You too can post media releases (aka press releases) on allmediascotland.com. For more information, email here.